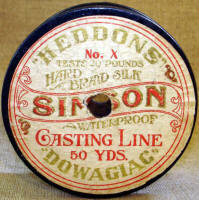 The Spool above, the Heddon Dowagiac Simson Line Spool was the 2nd in the evolution of the Heddon Dowagiac Casting Line. Descended from the Heddon Samson, it was first introduced in the 1915 catalog Titled Jim Heddon's Genuine Dowagiac Fishing Tackle and the Art of Bait Casting, and last showing up in the 1923 Catalog. After 1923 the line spool label got a complete make over, we see the Down Leaping Bass added to the Label. As well as, the name changing to, Black Gold, Hard Service and the Dandy Line. 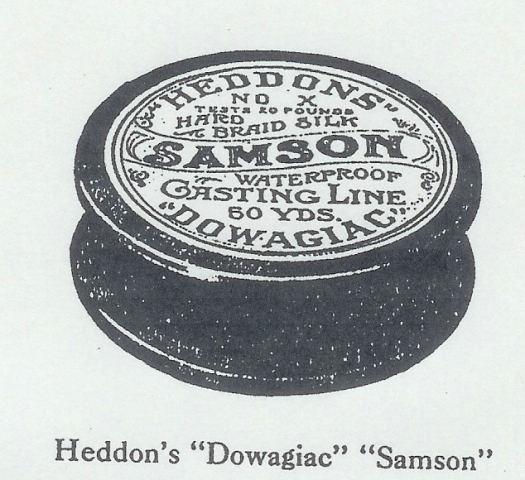 In the 1912 Heddon lure catalog, titled Heddon's Rod's, Reels, Line and Minnows we see the introduction of the Heddon Dowagiac co-branded line spool. We have combined our long experience and careful experimentation on Casting lines with the skill of the worlds best producer of these goods and are please to offer ere with the Heddon Dowagiac Brand of "Samson" and Easy Caster Lines. The effort of every conscience maker of high grade casting lines is to produce an article that affords a proper compromise between perfect casting qualities and strength, these two elements being antagonistic. In other words, a strong line must be necessarily be made of heavy and course, therefore being difficult to cast and to make a perfect spool when retrieving. In the new Heddon's Dowagiac Lines the angler will find these qualities most happily related and we offer the following lines as being specially adapted to casting lures of average weight of the Heddon's Dowagiac Minnows and without question the best quality possible to produce a casting line for this purpose. Avery Serviceable, soft braided, first quality Japan Silk Line, designed to meet the demand of anglers desiring extreme flexibility rather than excessive strength and wearing qualities. Color, Mottled Black. No. A has a breaking strength of 15#s and is best adapted to casting lures weighing from one-forth to slightly more than one-half ounce. Price per spool of Fifty yards, 75c. No B has a breaking strength of 20lbs and is adapted to use with our Minnows Nos. 100, and 150 Series, etc., for casting for large Bass, Pike, Pickerel and small Muskys. Prices, per spool of fifty yards, 90c. The Strongest heaviest casting lines made, size, and wearing qualities considered. Made from the highest standard Japan Silk, waterproofed and will float, making it ideal for use with Surface Bait, Color Black.